This is a book that one can put down and let linger for a time, it is well written and has interesting anecdotes and perspectives. Written by Yevgeny Primakov who was a journalist for the Soviet News Agency who then became a diplomat and eventually for a time was a Prime Minister. It does invite one to contemplate much of the contents. For those who have read about the Middle East and the Arab world, the information is usually fixated on the relativity to Israel or/and the West. The Arabs are usually outsiders or wealthy allies to be bought and invested in. Primakov is a man who with his life time of experiences in the region, had the best authority to write a book of this nature. He tells his side of the story as he saw it as an envoy of Moscow during the height of the Cold War. Though it does come across auto-biographical at times, Primakov does not insert himself into events excessively none of the of the events are about himself. Instead he reports more as a journalist with a touch of historian’s pen. Perhaps this is the influence of his early PRAVDA days which saw him spending much of his formative years in the region. This also may disassociate himself with moments and policies that with retrospect seem less flattering. So, as a reporter riding the currents of history, Primakov allows himself a pass in his prose. Much of the lacking is likely due to a degree of decided redaction, which certainly harms this book as a comprehensive source. The most interesting aspects of the book were in the earlier chapters which covered Arab nationalism. It addressed the often-claimed depiction of a powerful Moscow controlling and manipulating Arab regimes. This is the common theme when one reads contemporary pages and many general pieces on the era and region, that many of the Arab states were obedient and dependent proxies of Moscow. Primakov contradicts this message, especially regarding Nasser of Egypt who was not as socialist as he was painted, nor was he in Moscow’s favour as the Anglo-American view tainted him. He was after all an Arab nationalist. Primakov explains how Nasser helped to inspire other Arab leaders to imitate and institute their own form of nationalist government as best as they could, incompetence., corruption and other loyalties withstanding. Despite the world of that time being clumsily divided into two apparent ideological camps, the Middle East was a tapestry of shades that never satisfied Moscow. Primakov details how often Arab leaders embraced Moscow and the East Bloc only once they had been scorned, betrayed and misused by the West thus leading them to seek support or aid from the Soviet Union. No doubt convenient for both parties. Even though this book is written from an Arab and Russian perspective it does not attack Israel or the West with any serious fixation. This is likely also due to the period when the book was written and is in some way self-serving. 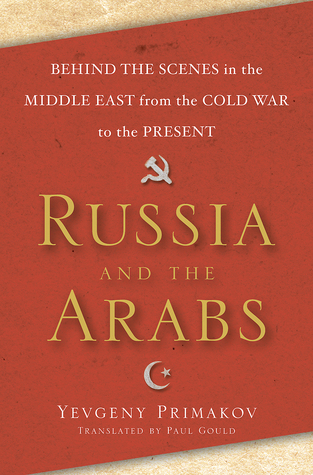 Primakov points out the faults and flaws found within the relationship of the USSR and its Arab friends. As well as the clumsiness and arrogance of both during moments of crisis and peace, where wiser alternatives could have been sought. It suggests that the Israelis were often over confident and aggressively arrogant, the PLO and its leadership are granted a far too kind praise at times. And the American’s always leading the dance that the Russians are struggling to keep up with, much of Soviet foreign policy was a reaction. The most interesting aspects of the book are from the conflict among the Russians themselves, the uncertainty of Soviet policy abroad is touched upon often in the book. It shows that those in the Kremlin were not in control and could at best respond to events that their allies or others initiated. Though the Soviet Union seemed strong it was struggling to maintain control from within itself, let alone across the globe. Because of these hints from the inside can inspire ones interest from the decayed reality of the Soviet Union, Andrew Cockburn’s “The Threat” would be a complimentary read to help dispel the depiction of the Soviet Empire as the malicious pariah as it was considered. The book ‘feels’ as though It provides a balanced depiction of events. Though that is the seduction of the writing style of Primakov and what he has no doubt omitted from his book. The book should be considered as a Pro Russian read, that does not mean it is an antithesis of the West either. It just attempts to inject balance into an imbalanced narrative of a certain period. The book was written around 2005 and came at a time when Russian-Western relations were less than chilled. The Bush regime and its war in Iraq are discussed towards the end and the projections Primakov make are with historical retrospect wrong. With the above in mind I would advise anyone interested in contemporary history or Middle Eastern politics to read this book. It most certainly provides a balance to many trendier books which seem to emerge after each event that befalls the Middle East or that seek to praise the major power that fights to master the region. It is not perfect and should not be read as a one stop read, perhaps Robert Fisk’s “The Great War for Civilisation” written around the same time is a far better book. But this is something that can be read as a compliment to more generic (ie Pro West) books.